Thom from the Shadowbinders podcast writes, "Journalist Brady Dale from the New York Observer joins us this episode (MP3) as we talk about the changing business model of webcomics. Are webcomics 'dead' -- or just evolving? How will social media play into the business model of digital comics going forward? And what about the money -- where is the MONEY?!" Dale wrote an excellent four part series (1, 2, 3, 4) in which he interviewed comics creators for frank discussions of how they deal with the rapidly shifting Internet world, the rapaciousness of Facebook in its handling of publishers, the competition from new entrants into the market, crowdfunding, and artistic satisfaction. “A webcomic is less about a comic and more about an entertainment website philosophy,” David Malki, Wondermark‘s creator and staff at Topatoco, told the Observer in a phone call. Mr. Malki takes pride in starting with his comic, but learning to make all sorts of products that share Wondermark’s sensibility without necessarily sharing its branding (for example, this iPhone or Samsung case). Once a creator starts to earn appreciable income from their artistic output, it raises profound questions about what their work means and what money means. 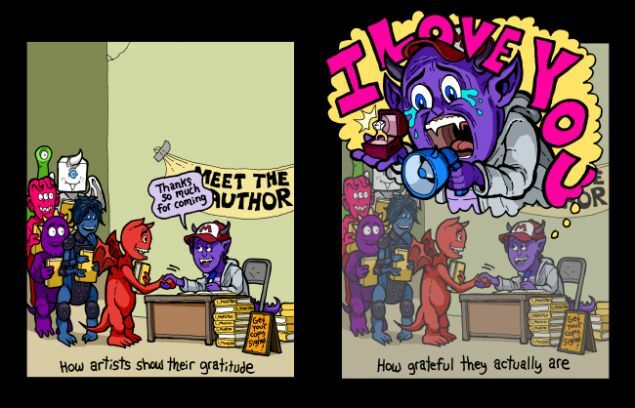 Here’s some perspective from how some of these webcomic makers have walked that line. “We’ve turned down many opportunities to do something that’d potentially bring us ‘real’ money because we felt it would harm the brand, the philosophy of C&H. Our time is very valuable, and we want to spend that time making things we really love,” Dave McElfatrick, one of the creators of Cyanide and Happiness, told the Observer in an email via a spokesperson. “My business is the art of balancing the need to make money with the desire to create,” Scary Go Round‘s John Allison wrote. He has recently expanded his work into comics, writing an ongoing title for Boom which is based on some past story arcs from his site, illustrated by other artists.